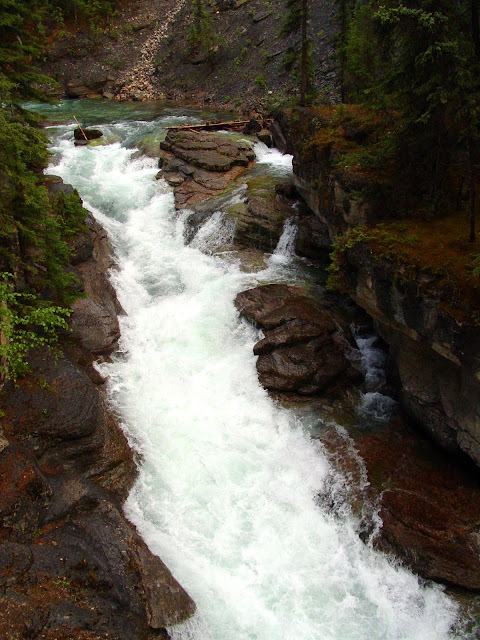 The whitewater in Jasper National Park needs no introduction. 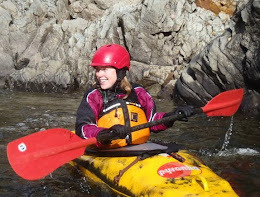 The rivers and creeks here have been well documented in various kayak movies (Twitch II, Entropy, Greyscale), guidebooks, and websites. 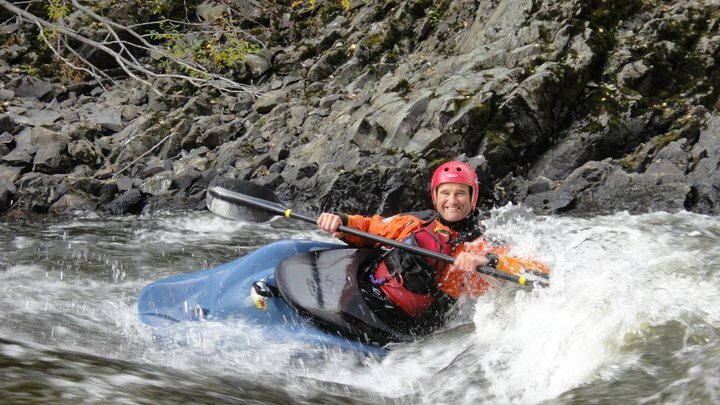 For paddlers in the central interior of BC, it’s a bit of a jaunt to get to Jasper. 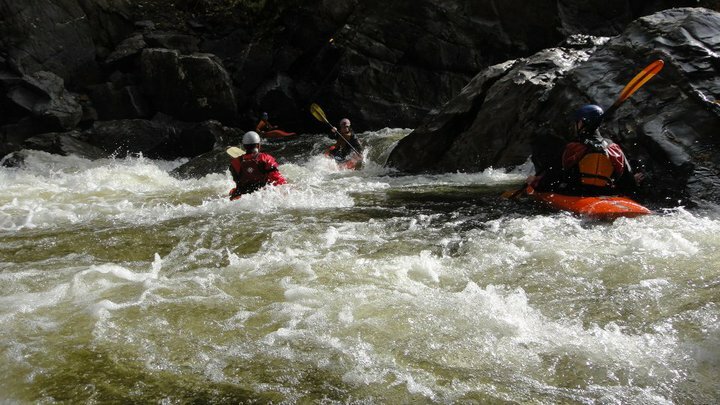 But when our local runs have dropped to low summer levels, the Rockies can still have some prime paddling and the road trip is well worth it. Recently I had the chance to do a few of the classics in Jasper, with Bliss-Stick kayak rep and local Andrew Loughlin. 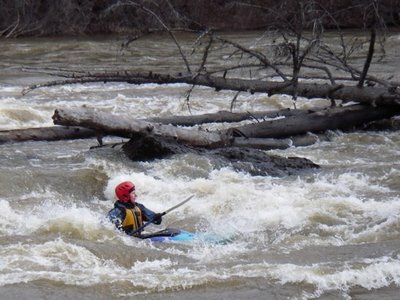 Probably the shortest most fun river I’ve ever paddled. 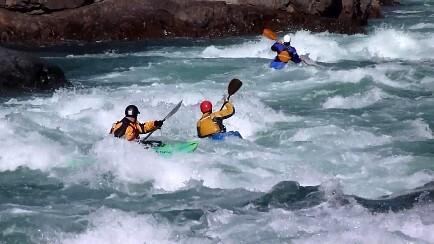 If you are passing through Jasper or have an hour to kill while there, get on this river cause it is super good times. This run requires no shuttle and scouting can be done during the 15 minute hike up from the Fifth Bridge off of Maligne Road, just east of Jasper. Ever climbed at the Rock Gardens? The suspension bridge crossing the river on the way to the crag is one of the take-outs. If you’ve hiked all the way down from the Tea House at Maligne Canyon you would have also passed by this section. The rapids are pool-drop in a fast narrow canyon with deep water before opening up into wide open easy boulder gardens. We skipped a gnarley rapid up top called The Sickle (pictured at the top of this blog post) and put-in above a 4 foot ledge drop shown above. This leads around the corner into a hole then a series of drops called Two Timer and Turbo Booster. After this it’s a class II float to the finish. What a hoot! Levels were considered medium for our run. The Astoria River shown above flows out of Amethyst Lakes in the Tonquin Valley. The lower section starts just above the Highway 93A bridge that crosses the river, south of Jasper. From the bridge you can get a good idea of what you’re in for --- continuous steep boulder gardens and a few fun drops. The take-out is where Highway 93 crosses the Athabasca River. 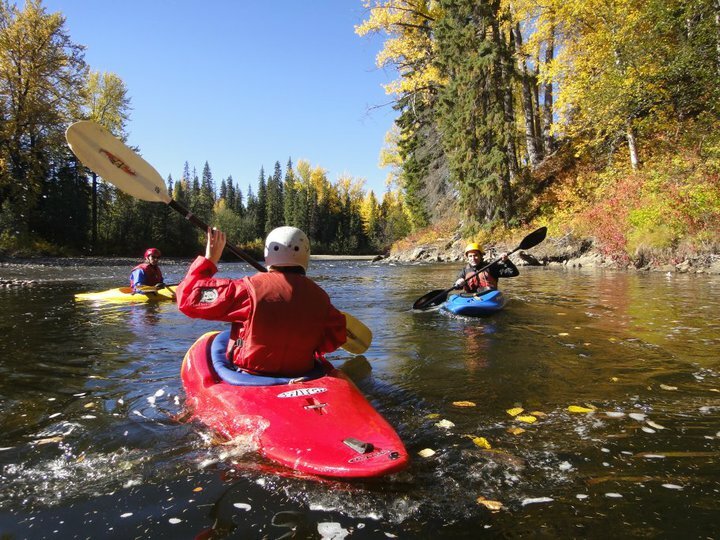 The run is about 3.5 km on the Astoria and a couple clicks of floating down the Athabasca. According to Andrew, levels for our run were low and it's much better at higher flows. It’s still worth doing at this level but I would like to return next year earlier in the season. 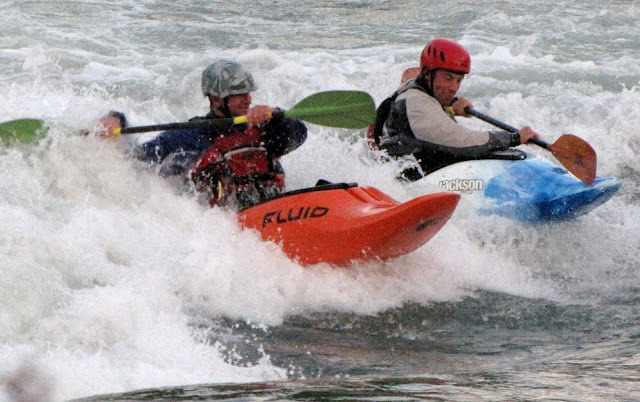 The action is non-stop with very few eddies and constant holes and rocks to navigate. Other than the three drops you can see under the bridge, there is a surprise canyon drop in the middle somewhere that we didn’t scout, but the line was obvious enough. 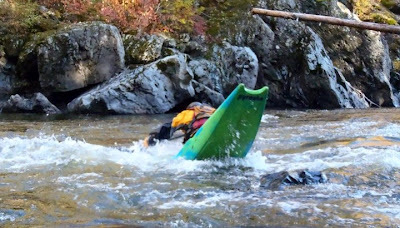 In the lower part of the run, there was one wood hazard Andrew was able to somehow duck, but I opted for the portage. 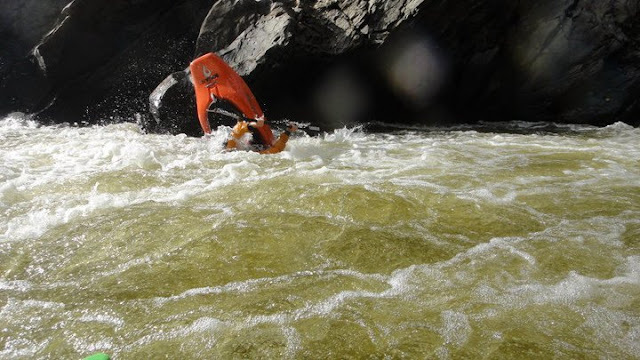 The river was shallow in many parts and flipping would not be pleasant. Other than a good brace, elbow pads are highly recommended. 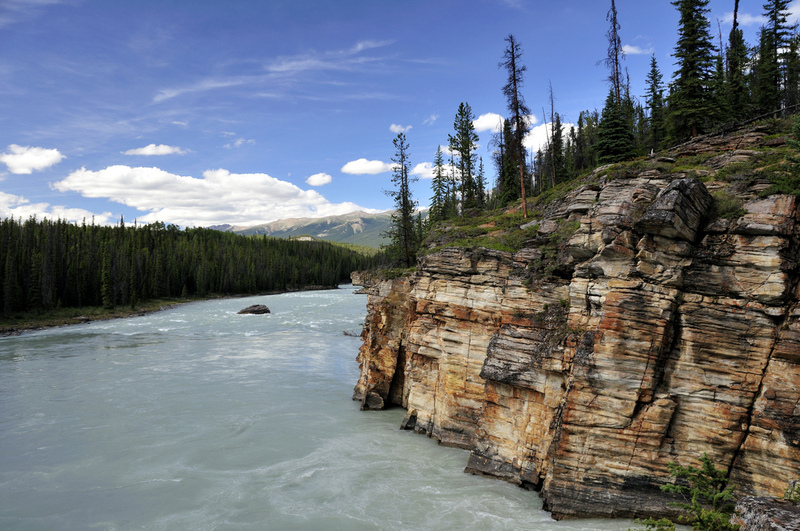 There are numerous sections of the Athabasca in Jasper Park, many of which are rafted by commercial companies. 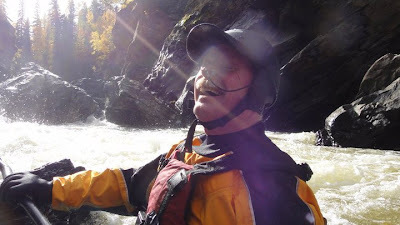 While there aren’t any significant rapids, there are some stretches like the run below Athabasca Falls that have some fun waves trains, pushy water, and catch-on-the-fly surf. However the best part is the scenery of the Athabasca Valley and surrounding peaks – gorgeous! The take-out is on Highway 93A at the “Meeting of the Waters” where the Whirlpool and Athabasca meet. 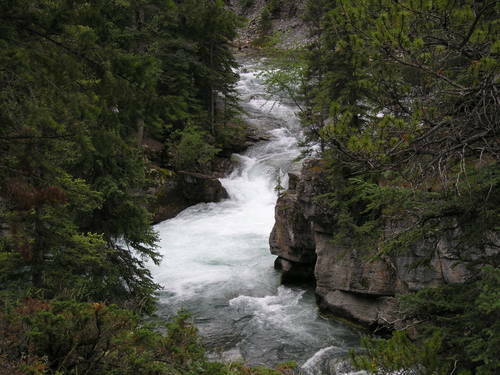 The put-in is also on Highway 93A at the Geraldine Lakes parking spot, with a short trail down to the river below the canyon at the Falls as shown in the picture above. The run is 12 km long, and most of the action is in the first few kilometres. 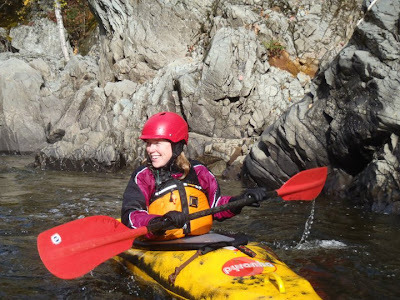 The water is milky glacial runoff, so bring your mitts. After Andrew gave me the beta for access, I made the solo trip down this run to enjoy the views. The rivers I’ve listed above are just a taste of the whitewater Jasper has to offer. Other classics include Beauty Creek (V+), Upper Astoria (V), Fiddle (IV), Upper Whirlpool (IV), Sunwapta (II-III), Lower Whirlpool (II), and the Athabasca River Mile 5 section (class II). 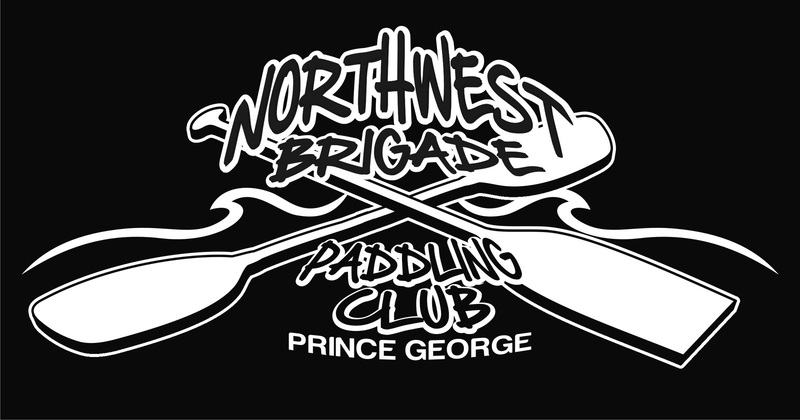 For more information check out the Kayakwest website, Paddling ABC, and Kayak To Hell. You can also get all the info from the guidebook for the Canadian Rockies by Stuart Smith. 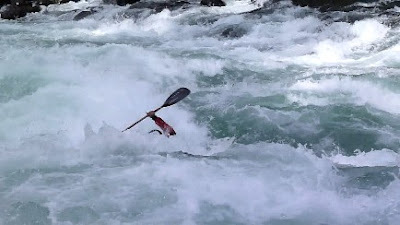 The 2010 Tatlowfest was held on July 9 -11 at the lovely Tatlow falls site on the Bulkley River. 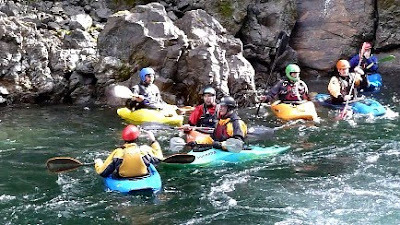 Boaters made the trek from Terrace, Kitimat, Smithers, Quick, Burns Lake, Vanderhoof and Prince George to enjoy some of the whitewater in the Bulkley Valley and help out with upgrades to the Tatlow Falls site. The paddling focus this year was beginner/intermediate, so weekend runs were on the Suskwa River (class II-III) and the Telkwa (class II). 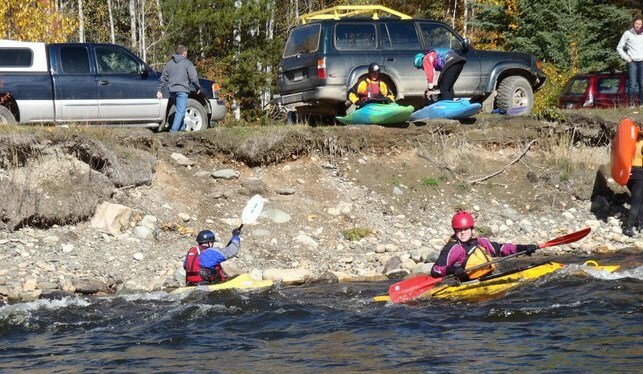 Of course there was lots of playboating on Tatlow Falls as well, as shown above. Levels for the rivers were low, but still super good times. The Sunday afternoon workbee down at Tatlow falls was needed to complete some badly needed site upgrades. The enthusiasm and energy everyone showed was stunning and more was accomplished in four hours than we had planned for two years. We now have new benches (shown below), new no slip'r trip steps to the outhouse and beach, upgrades to trails, new concrete picnic table pads, and some much needed bank stabilization along the water. 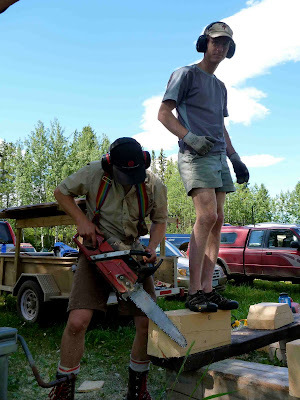 For materials, thanks to Kevin and Ben at the Ministry of Tourism, Culture and the Arts and to Smithers Lumber. We followed our work up with the necessary beverages, surfing and a good sweat in our new (Thank you Timm Johns!) on-site sauna. Our thoughts over the weekend were with Rod Leighton who is beginning an uncertain journey forward after a recent mountain biking accident that injured his spinal cord. Along with the rest of his full life, Rod is a staple member in our local paddling community and has been enormously generous to the BVKC as we worked to regain access to Tatlow Falls in 2009/2010. He has donated time, effort, humour,finances, muscle and class to everything we've been working on. Rod was down mowing the Tatlow lawn just a week prior to his accident. Much of the energy of the weekend was focused on hope and optimism for Rod. We heaved rocks and paddled with smiles. Thanks to those who helped with the river trips, and to everyone who came out to join us for the weekend. You made it great! 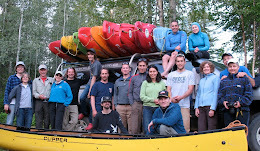 For more pictures of all the work and paddling and lots of the great people that came out, check here: PICTURES. In 1952, the Nechako River was dammed near its headwaters as part of the construction of the Alcan Kitimat-Kemano Project. Approximately half the water was diverted westward through a tunnel in the coastal mountains to power an aluminum smelter in Kitimat. The remainder was re-routed through a spillway at the eastern outflow of the reservoir. From the spillway, water flows into Cheslatta River and drops into the foot of the Nechako Canyon via Cheslatta Falls. It is here where the Nechako River now starts. 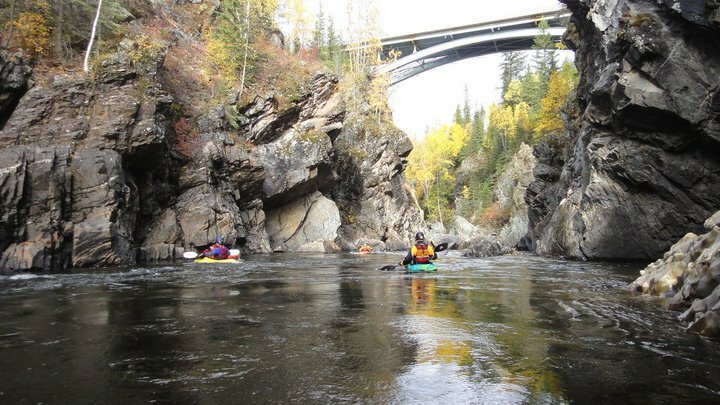 The Nechako Canyon - once a formidable 7 km long stretch of whitewater as shown in the historic photo above - is now a dry riverbed. 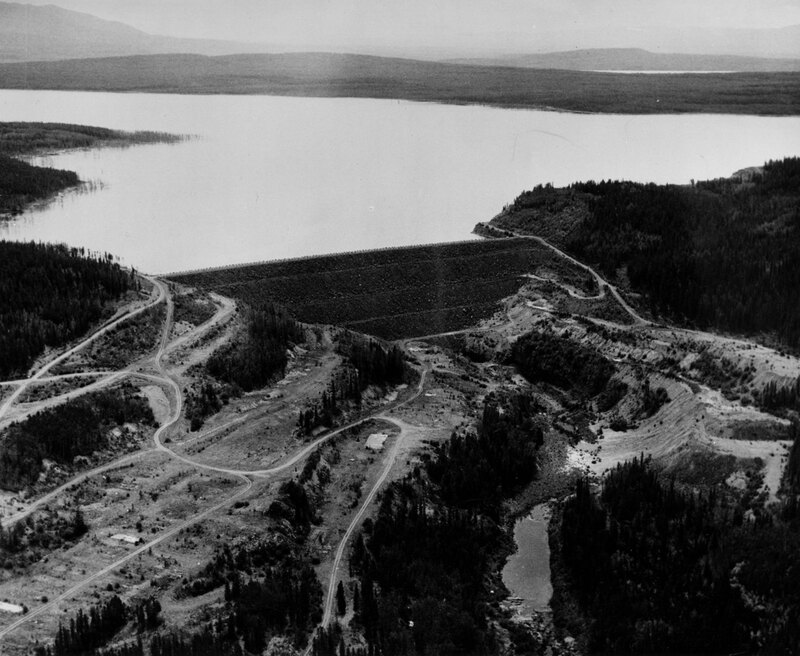 The 320 km long chain of lakes and rivers that was the source of the Nechako has become a massive 87,000 ha reservoir, shown below with Kenney Dam. 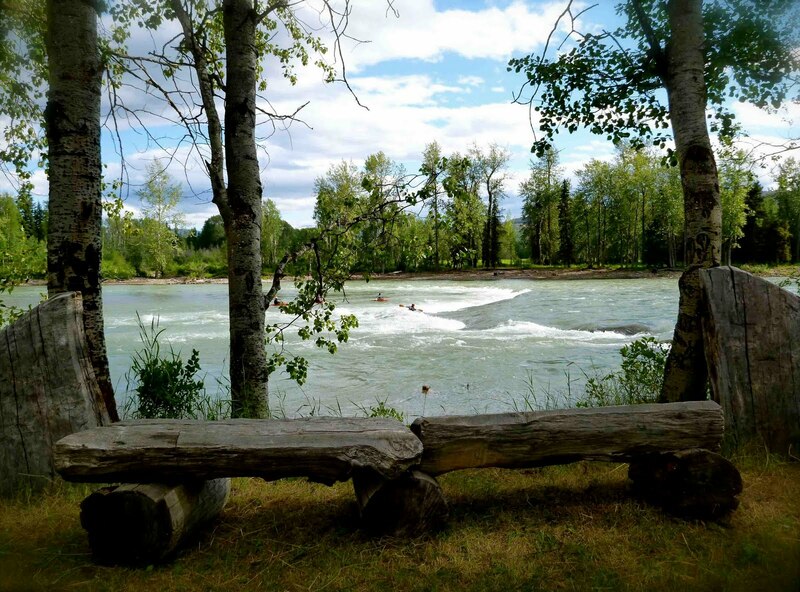 As only half of the pre-1950 flow still drains eastward following the Nechako River, the reduction in flow has resulted in an increase in water temperature and an ongoing problem for the salmon run. The level of the river is managed “in order to achieve a balance among the various needs and interests” (Rio Tinto Alcan, 2010) - primarily power generation and fisheries management. 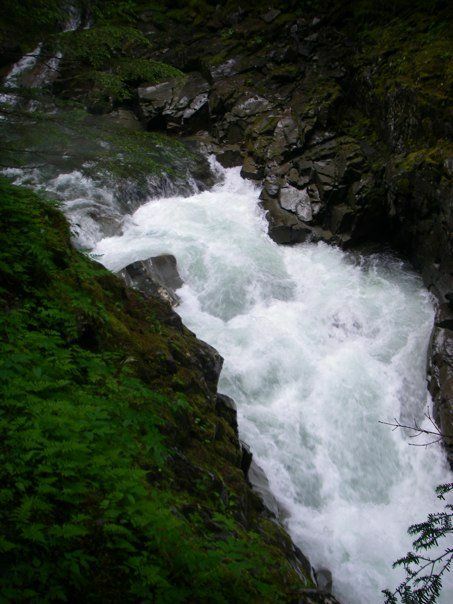 During the summer, flows are typically increased to moderate water temperatures for migrating sockeye and Chinook salmon. This explains why the level of the river is going up right now when all other rivers in the area are decreasing. In its day, the Alcan Kitimat-Kemano Project was the largest privately-funded construction project ever undertaken in Canada. It created the town of Kitimat in a mostly un-populated area of the province, and was heralded for generating significant economic stimulus in a relatively undeveloped region. Because of this drive for progress however, consequences were not seriously considered. During construction of the Kenney Dam and filling of the reservoir, the upper Nechako River suffered almost a 100% loss of flow. When 50% of the flow was restored 3 years later via the spillway into the Cheslatta, the comparatively large discharge down this small tributary scoured a deep channel and deposited huge volumes of sediment in the upper Nechako (Kellerhals et al., 1979). Fisheries were decimated, and the environment in the upper watershed was forever altered by the reservoir. The long term fisheries impacts due to a reduction in flow have also been significant, but because of the cumulative effects of other developments along the river like agriculture, forestry, and urban settlement, these have been difficult to measure. Below is a recent picture of the Cheslatta River near the Holy Cross FSR south of Fraser Lake, about 1 km before it plunges into the Nechako Canyon. There were significant social impacts as well, particularly on local First Nations. The Cheslatta T'en were given just a few days notice before the reservoir started to fill, and they were displaced with little compensation. Many had to abandon their traditional occupations of hunting, trapping and fishing, and were forced to build a new life in a farming community with which they had little in common. Many lost their livelihoods and their way of life (Carrier-Sekani Tribal Council, 1984). Alcan’s operation has not been without political controversy. 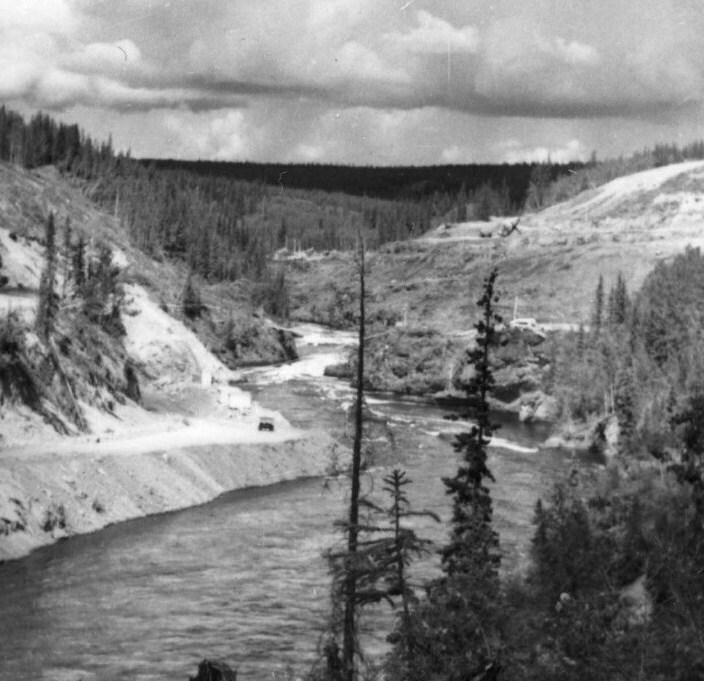 In the original 1950 agreement with the Province, Alcan was provided with water rights to the Nechako River. This gave them the license to divert all the flows from the upper section of the river. During the 70s, flows were reduced as Alcan increased power generation at its Kemano plant. It took several years before the federal government was able to take legal action and force Alcan to release more water to protect salmon (Quinn et al, 2008). Later in the 80s, Alcan initiated the Kemano Completion Project to increase its power generating capacity. The plan was to divert even more water from the reservoir for hydro power. This would have taken 88% of the pre-1950 water levels from the Nechako River. Due to significant public opposition, the project was killed by the Province in the mid 90s. After Alcan took the Province to court, the Province agreed to provide Alcan with replacement power from BC Hydro totaling more than $100 million. Alcan then agreed to further invest in Kitimat by upgrading their aluminum smelter which the Province claimed as a victory. Hooray! Interestingly, Alcan generates some of the cheapest power in the world, so what they generate beyond operating their smelter and for the town of Kitimat is sold back to the Province for a profit (Sheppard, 2006). There is no doubt that Alcan has benefited the northwest, but whether or not these outweigh the environmental and social impacts is debateable. As well, it’s questionable if the agreement Alcan has with the Province is fair deal to the public of British Columbia. Also, while the power generated here may be more sustainable than oil and gas, considering its history it would be dubious to call it green power. Increasingly, more is being demanded from our natural resources. We also know more now about how the health of the environment and society are linked, and I'd like to think as we continue to move into the 21st century we can make more informed choices and balance our lifestyle accordingly. Of course we need electricity, but at what expense? And for what purpose? In light of what happened to the Nechako and the deal Alcan got for a public resource, I think about some currently proposed megaprojects and wonder if we've actually learned anything at all. Two that come to mind are Shell's bid to develop coalbed methane at the headwaters of the Stikine, Nass, and Skeena Rivers, and the proposed Enbridge Pipeline with tanker traffic on the north coast. If you live in the northwest, these might be difficult choices for you because of the region’s need for economic stimulus. But really, how sustainable and fair are the benefits? And are they worth the environmental impacts and potential risks? The Nechako River will never be what it was 60 years ago because it's a done deal. However other parts of the north still remain unspoiled. It would be wise to critically reflect on the past and what we already have learned before we make similar mistakes. 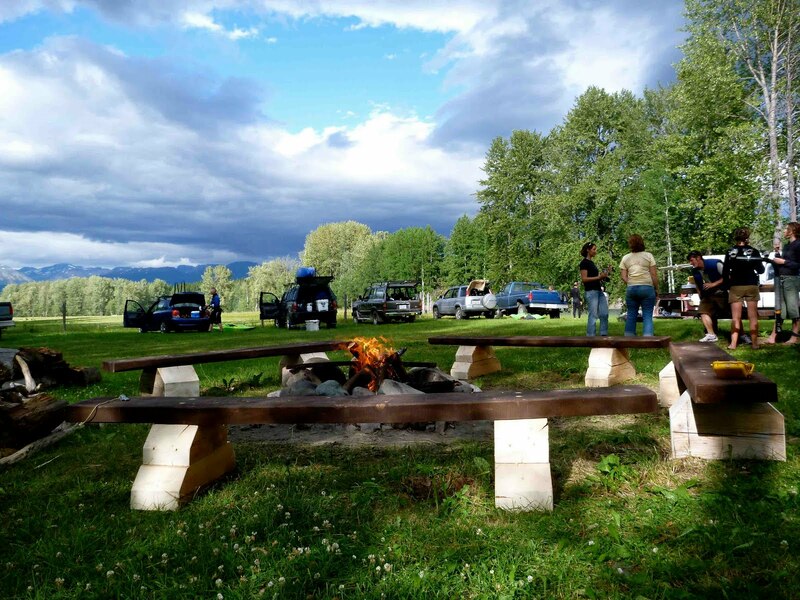 If you're interested in supporting conservation efforts in the northwest, check here to find about about the Skeena Conservation Alliance: Skeena. 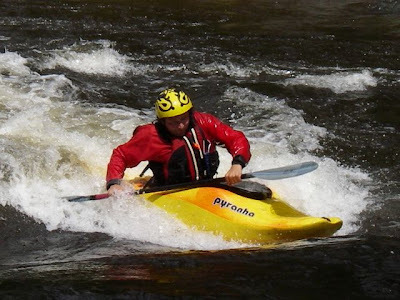 Enjoy the summer, and hopefully see you on the river soon. Over the July Long Weekend, Ben, Mike, and I from Prince George made the trip out west to check out some of the whitewater in the Smithers and Terrace area. 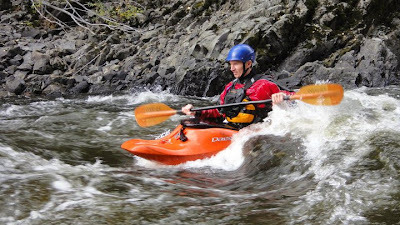 With river levels dropping quickly across this part of the province from low snowpacks and little rain, we didn't really know what kind of action we would find. The plan was to hook up with some of the friendly locals and see what was running once we arrived. When we rolled into Smithers on Wednesday night, we met up with Sean who took us out to East Boulder Creek. 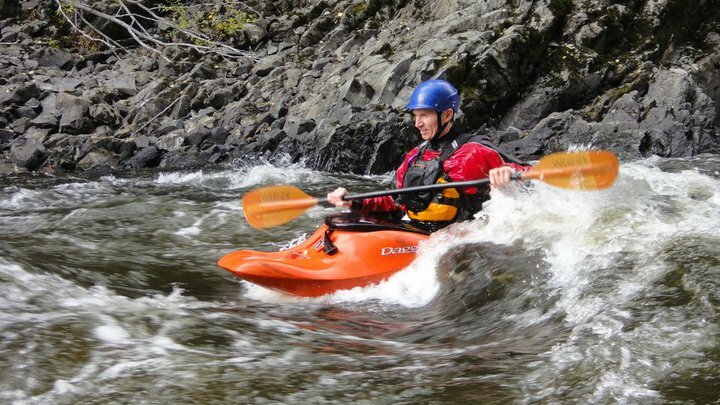 This run is a northwest classic and a testpiece for any aspiring advanced boater. 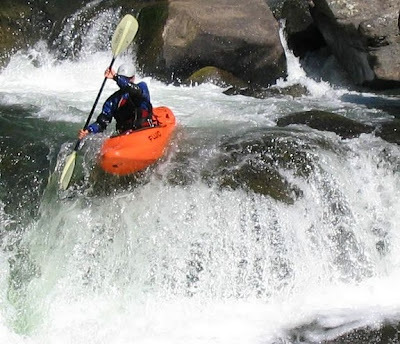 Boulder is challenging (class IV+) and super steep --- there are seven waterfalls ranging in size from 7 to 20 feet tall, a gnarley slot, numerous shallow technical boulder gardens, all stacked within 800 meters of river. Levels were considered medium, but after having a look I thought it was a little much so I ran shuttle while the boys put-on. I felt somewhat justified chickening out after I watched our guide swim on the first drop --- a stout 20 footer called Blue Fungus. But at the take-out I could hear the hoots from the canyon below and from the grins on their faces, it was clear this run was a must-do for next time. In the morning we decided to check out the playspot at Tatlow Falls on the Bulkley River with our friend Tlell. This is the local park-n-play spot for Smithereens. While the wave itself can be pretty flat it still gives enough speed and retention for decent surfing. After an hour or so of fun and good times, we packed up and headed further west to Terrace. 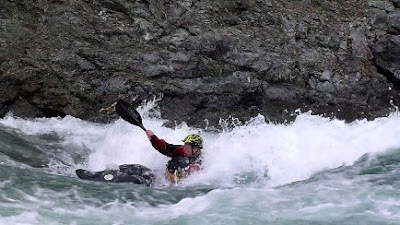 Terrace is argueably one of the best whitewater destinations in the world. There are several road trips worth of runs here, mostly in the class IV and higher range. We were lucky to have PG ex-pats Joe and Morgen set us up in their super nice home on the Skeena River, which put us within easy striking distance of all the goods. Later on Thursday afternoon, we headed up to Williams Creek and ran the race course to waterfall section (class IV). Despite very low levels and a bit of bump n' grind between the rapids it was still fun, especially the last drop --- a super clean 10 footer into a nice pool. 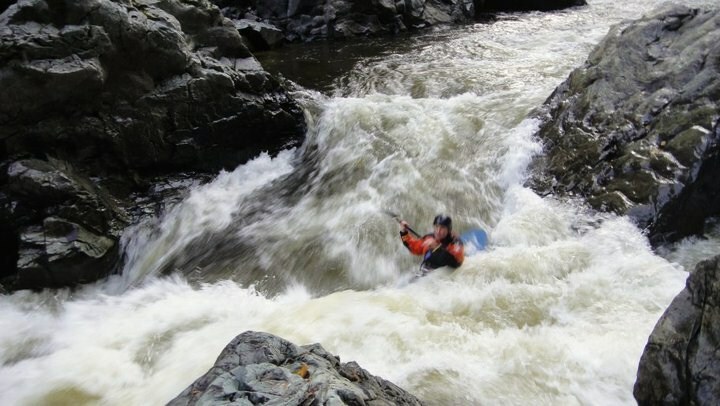 I imagine this run at higher flows would be pretty amazing. Next year for sure. Later that night at the pub, Ben and Mike hatched a plan with Corey to run Hirsh Creek the next day, one of the hardest runs in the northwest. Unlike East Boulder, I had no problem opting out of this one. 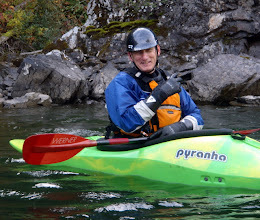 So then on Friday AM while the boys headed to Kitimat for the Hirsch, Joe and I took our playboats to the Kalum River (class III+). 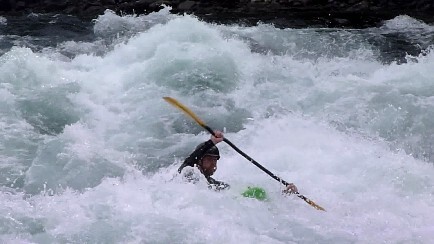 I haven't been on the Kalum since the Terrace Paddle Party in 07, but remembered some big water. Yep, this is a super fun big volume run with lots of huge haystacks, a few holes, and good play. 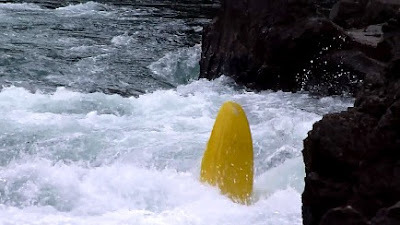 During our run, the level was about perfect to form a monster crashing diagonal in the second canyon called slap wave. Joe had a good chuckle after I got the slap-down. Youch! Reports from the Hirsch were as expected, an intense full-on class V creek. Ben got a chance to perfect his underwater cartwheel in one of the drops, while Mike found a good sized boulder to test the strength of his helmet on. Nice one! Once again later that evening we ended up at the pub, discussing ideas for what rivers or creeks to do for the next day. Having heard a lot of good things about the Shegunia Creek near Hazelton from a number of people, we figured this was the run for Saturday. We made the call again to the Smithers posse, and thankfully got Corey's girlfriend Amy to run our shuttle. Shegunia Creek comes out of the Tomlinson Mountain Ranges around the Suskwa and enters the Skeena near Kispiox. There are two runs, the lower (class IV-) and the upper (class IV+). 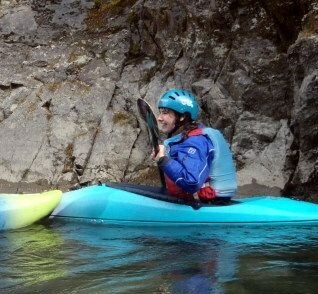 We did the lower run, about 22 km of paddling. The top part and bottom are mostly shallow easy boulder gardens, while the middle section is a long and very deep committing canyon with continuous pool drop rapids. One of the highlights in the canyon section was the Birth Canal (shown below), a drop into a long narrow winding chute. Another highlight was near the end of the canyon called the Coliseum, where the shear canyon walls tower almost 100 meters straight above the river. Amazing! There was also a ton of wood on this run requiring careful navigation and a couple portages. 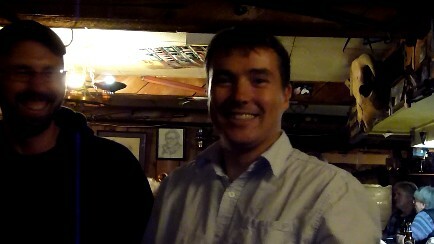 After five or so hours on the river, we were driving back to Smithers for dinner and a late night of beers and cheers. The plan for the last day was to do East Boulder Creek again before heading home, and this time I was in. Levels were slightly higher than the last time, in fact it was primo by local standards. Running a creek like this requires a pretty solid and organized safety plan, and thanks to Sean for leading this up. We pulled Mike out of the creek after his deck imploded when he plugged the landing on Blue Fungus, and I got rescued after getting stuck in the second falls on Double Drop. Two of our crew also got broached on a mid-stream boulder just beside a log jam and needed help getting unstuck. Overall however, it was a great run and the cheers at the take-out this time was definitely well-earned. Lost and Found: At the put-in of East Boulder on Sunday afternoon, I thought I'm probably gonna be so nervous I won't really want to get out and take pix on the run, so I didn't think of taking my camera. But Mike said he'd grab it and take some of us running the first waterfall. Not being one to turn down a kodak moment, I agreed and ran the falls and Mike gets the shot. Sweet! My camera then ends up in Seans boat and after running the teacup section, I decided I wanted to take a picture of the four waterfalls, which is a very impressive view (that you'll have to imagine now - dough!). We looked for the camera in Sean's boat and quickly realized it somehow fell out while setting up safety earlier. Losing the camera isn't actually that big of a deal it's losing all the great pix I had from our trip. Crapola! Amazingly, a couple weeks later, Corey found the camera floating behind one of the waterfalls, and 3 months later it was finally returned. The camera died but the memory card is fine. For all the pix from this trip check it out here: northwest trip. That's all from this road trip. Thanks to everyone that gave us the great hook ups along the way, especially Sean, Joe, Morgen, Amy, Corey, and Tlell. Till the next one, keep on paddling! !